My wife and I had a wonderful experience with the glacier tour! We saw some incredible sites that we'll remember forever...many pictures! Our guide for the day Ed was wonderfully knowledgeable, not only of the area but also the history. Many interesting discussions ensued. We also very much enjoyed meeting our tour mates! Well-worth taking this trip. Absolutely stunning scenery, although our guide could have eased up on the military-style organisation of the group. We were on holiday after all! Otimo atendimento. Pontualidade! O guis prestativo e muito atencioso.O passeio do nao foi melhor devido a fumaca que veio dr um incendio de grandes proporcoes na divisa com EUA. Encobriu o visusl dos lagos ,montanhas e de um glacial tambem.Felismente nao atrapalhou para caminhar no gelo.Foi muito bonito! The tour guide Alice was brilliant ! She made the trip informative and interesting with her great knowledge and sense of humour. Alice ensured everyone on the bus looked after. No one was ignored or left out as sometimes can happen in a group trip. My only disappointment was that there was not enough time on the glacier. The 15-20 mins flew past and seemed very rushed. The picnic stop turned out to be amazing as we got lucky and saw a bear in the woods !. A big thank you to Alice for looking after the group. Highly recommend the tour and company. Coming from the deep south, this was such an unique experience!!! Totally impressed by the beauty and majesty of the area! We only had 3 full days for the visit, so we took tours each day. Each tour was different. We know we would not have seen and enjoyed a fraction of the things we experienced if we had tried to do it ourselves. The guides were knowledgeable and friendly. Would go back again in a heartbeat!! Fantastic day. Stunning stops to and from the glacier, and Ed was a lovely, informative guide with a lot of knowledge. This trip was the perfect first jaunt into the park. The glacier itself was a little touristy, but when on vacation, it's okay to be touristy. Awesome day. 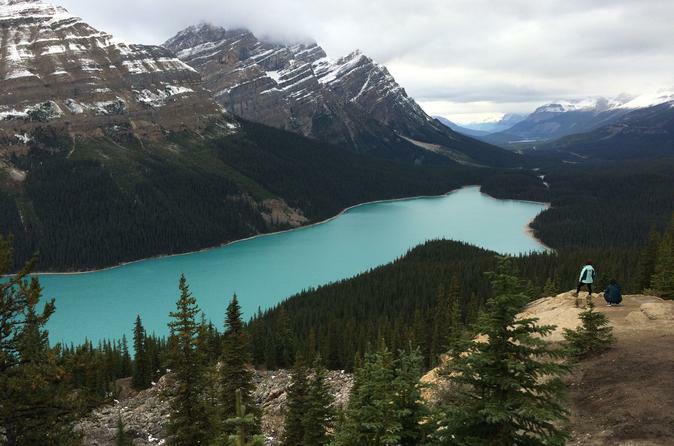 Stop at Bow Lake was spectacular! Hallo, leider haben wir nicht den Lake Luise gesehen obwohl in der Wegbeschreibung dies angegeben war. Dies habe ich bereits reklamiert. Wir haben nur die Toiletten am Lake Luise gesehen. Das Essen war ebenfalls sehr miserabel. Wir haben die Fahrt am nächsten Tag in Eigenregie durchgeführt. Wir verlangen eine angemessene Rückzahlung von ihnen. Départ du centre-ville de Banff vers 9h30 AM, on emprunte la magnifique Iceflieds Parkway. Première partie : Visite du lac Bow, vue sur le glacier Crowfoot. Petit arrêt pour un pique-nique à Saskatchewan Crossing. Le repas est fourni : chips, wrap, pomme, jus de fruit et brownies. 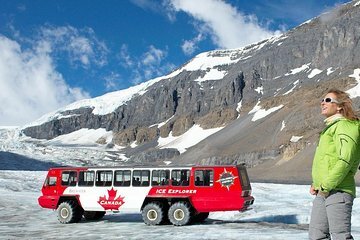 Seconde partie : Accès au glacier Athabasca avec un véhicule spécial, puis visite du lac Peyto sur le chemin du retour. Notre guide, Hugh, était très sympathique et passioné, bien que la visite fut soumise à un timing parfois serré. The sites were stunning. Be prepared for a long drive with a few stops along the way for photos, washrooms and lunch. A little disappointed because the tour description mentioned a stop at Lake Louise, which didn't happen, not sure why as no reason was provided...we had to make our way there the next day a Saturday with tons of other visitors and had to park in the overflow lot and take the shuttle, and it wasn't even 9:00am. The glacier was an amazing experience, freezing, but amazing. Remember that when your Ice Explorer guide/driver gives you a time to be back on the bus, BE BACK ON THAT BUS, as our driver almost left the glacier without a couple who were too busy taking photos to keep track of the time. The buses run on a very precise schedule which is a well oiled machine. Be sure to do the hotel pick-up as there is no full day parking in the bus pick-up lot. Despite having spoken to someone from the tour company the previous day and being told that we could park in the lot, we returned from the tour to find a 50.00 parking ticket on our car, and we weren't the only ones from our tour who returned to this surprise. If you're good with driving and packing a lunch, I'd suggest doing the drive yourself, as there are tons of turnouts and washroom stops along the parkway for breaks and photos, all with signs and interpretive boards providing the history and explanations of everything. Driving yourself will also give you more or less time at each stop so you won't feel rushed or have to wait for others to load the bus.